There are a lot of different solutions on the market today for enterprise collaboration, active learning, and custom interactive video walls….but there’s only one company with a platform that does them all. That company is T1V, and at an event on April 26 hosted by HB Communications at Leyard and Planar’s New York City showroom, the firm gave local integrators and end users the opportunity to see firsthand how its ThinkHub suite of software solutions can transform the way institutions work and teach. 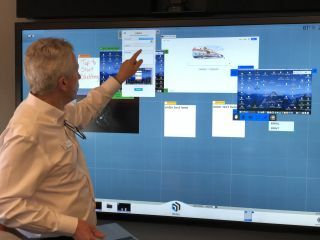 Essentially, the company specializes in multi-touch, interactive, BYOD-friendly software that runs from Macintosh hardware and transforms just about any touch-capable display into a collaboration ecosystem. It comes in multiple iterations tailored for its core use cases. These include ThinkHub for BYOD collaboration and videoconferencing in enterprises; ViewHub for presentation; and ThinkHub Connect, a hybrid solution aimed specifically at active learning classrooms—a burgeoning market upon which the company is placing increased emphasis. Local integrators and end users gathered at the Leyard and Planar NYC showroom on April 26 to see T1V's software firsthand. Another differentiator for the company, LeClair pointed out, is in what it can provide for multiuse spaces in corporations and educational institutions. T1V has long specialized in software for larger-format, “wow-factor” video walls—think touch-interactive timeline walls that display a company or university’s history along with photos and videos. With the company’s software, these walls can double as ThinkHub canvases, allowing for far greater utilization. Paul Patrick demonstrates the ThinkHub's ease of use. Following LeClair’s presentation, attendees were able to try out the T1V software on several different Planar displays throughout the showroom. During this time, Paul Patrick, the company’s vice president of business development, led demonstrations and fielded questions from a group of higher education technology managers. For those interested in trying the platform, T1V has demo equipment that it can bring onsite, as well as a ThinkHub Connect mobile demo unit that it brings to campuses and corporate facilities.